Is the Sookie Stackhouse series Dead in the Water? 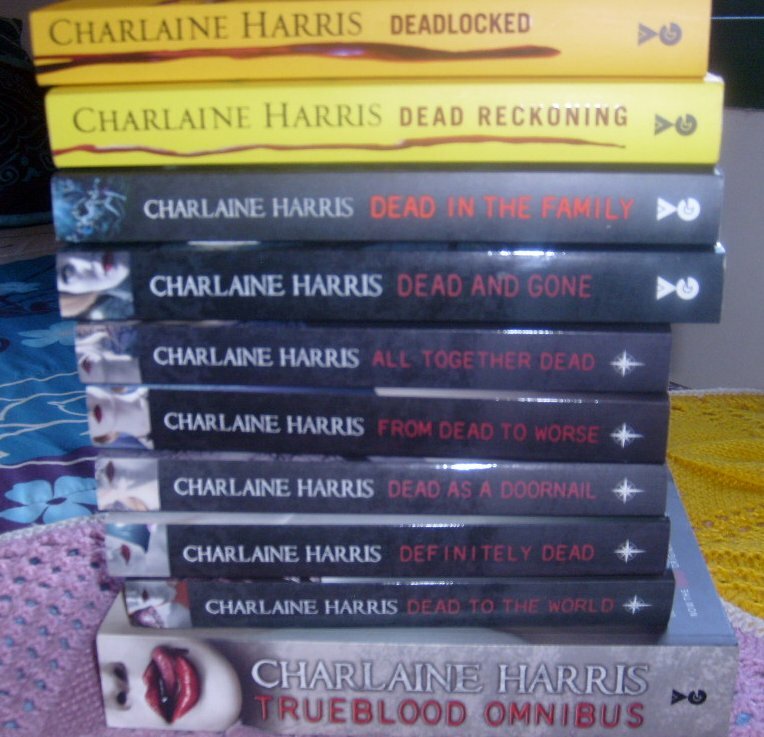 Deadlocked by Charlaine Harris is book twelve in the Sookie Stackhouse series. If you have no idea what I’m talking about, maybe you’ve heard of the HBO series TrueBlood? The Sookie Stackhouse books form the basis of this series. There are a lot of similarities between the two, but the TV series goes off into completely different storylines – sometimes better, sometimes worse. The point I’m trying to make in a convoluted way is that if you’ve seen the TV series and like it, you’ll also like the books. You can read these and be surprised by where they take you. I’ve decided to write this review as more of a commentary on the series. It’s kind of hard to review book twelve when many of you may not have read the eleven books before it. The books are set in a small southern town in Louisiana called Bon Temps. Vampires have just come out of the coffin the world over, thanks to the invention of a synthetic blood substance called TrueBlood. Now there is no need for them to feed off humans and they can take their place as members of society – albeit living dead ones. Of course there are vampires who aren’t too happy about being ‘outed’ and who continue to feed on humans. And there are a lot of humans who believe that the only good vampire is a staked vampire. Sookie Stackhouse is a blonde-haired, feisty barmaid who knows what it’s like to be different. She has been telepathic her whole life and can hear the thoughts of all those around her. When vampire Bill walks into her bar and she can’t hear his thoughts, it’s the start of a whole new life for Sookie. She soon learns that not only do vampires exist, but werewolves, shape shifters, witches, demons and fairies as well. There’s a whole other world out there and soon Sookie is caught right in the middle of it. What I love about these books – besides the imagination – is the interaction between characters. Charlaine Harris writes hilarious one-liners. Characters leap off the page. Imagination drips from every page. Plus there’s a mystery or two to solve in every book. The vamps in this series make the Cullens in Twilight look like the Brady Bunch. But as much as I love Charlaine Harris, she should have ended this series a couple of books ago. It is definitely Dead in the Water. Deadlocked just felt like every significant character that has ever been in the books, popped back into this plot for no other reason than a cameo appearance. I also couldn’t remember what had happened in the last book, so spent the first half of this book a little confused. That’s the problem when you have a year between books. There were too many characters in this book and juggling them all together just didn’t work effectively. It’s a shame when one of your favourite authors disappoints you. I guess you have to know when to bow out gracefully. Having said that, I still devoured this book and will read the next one. I read the other day that next year we’ll see the final book in the series. Sadly, I do think it is time to lay this series to rest. The end of this book also gives a big hint about what is next for Sookie. Don’t be put off by this review and do sink your teeth into this series. Then come back and let me know if I judged this book too harshly. I’ve read several books and liked them quite well, but I tried the sixth or seventh and thought Harris had run out of gas. I’m sure it’s hard to give up the money and to disappoint fans always wanting another book. Thanks for stopping by. She def. has run out of gas but hopefully will come back with a fresh new series. I love the show and have the first 3 books on my shelf. They were on sale as a bundle and I can’t wait to read them!